Product: Lifetime Basketball Hoop - 71558 Portable Basketball Goal - 50 inch Backboard. Lifetime World Class XL Portable with a 50" Shatter Guard Silver Fusion"! w/ Reactor Rebound"! Backboard, 3 pc. 3.5" Round Gray HT Action Grip Pole, Orange Power Shock"! Rim. Counter Balance Springs Helps to Raise and Lower Backboard. Fills with Sand or Water. 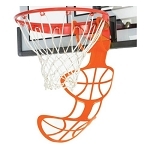 We also carry several other alternative manufacturers of portable basketball hoops. Please also see our Huffy Basketball Backboards, Goalsetter Basketball Hoops, Goalrilla Basketball Goals, and Spalding Arena View Basketball Systems. All of these manufacturers make create basketball systems. Most of them are meant for outdoor use; but, some can be used indoors.